NEN is joining World Bio Markets 2018. The congress is held at Passenger Terminal Amsterdam (PTA), on the 20-22 March 2018. What does a truly sustainable business model look like? 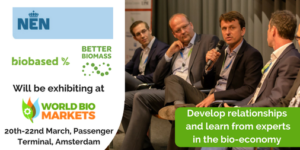 What are the business drivers of adopting bio-based alternatives? How can bio-based contribute towards sustainability metrics such as CO2 reduction and recycling? With this invite, we are offering you 15% off of your full access pass Contact us for your discount code. The Better Biomass certificate is used by organizations to demonstrate that the biomass they produce, process, trade or use meets well established international sustainability criteria.